This illustrative design tutorial will walk you through the creation of a symmetric illustration, how to approach the creative task of illustrating sci-fi fan art and other general methods for refining your overall creative process. Suffice it to say I am a geek and enjoy sci-fi. This specific tutorial touches on my admiration of all things Star Trek. Specifically, I enjoy the Ferengi characters in the Star Trek universe. I find their back story and ethics humorous. My favorite character is Quark from "Star Trek: Deep Space Nine" TV series. This illustration is Fan Art. It was created for no other reason than I'm a fan of this particular science fiction TV show. I can't sell the art since I don't technically have rights to do so, but I can use it to just have fun and that is a good enough reason for me to do it. Before you illustrate anything you need to have good reference. In other words you need to know what to draw before you start to draw it. In general, I was familiar with what this character looked like, but it helps me to study it closer and glean key visual attributes I can capitalize on as I begin drawing. In this tutorial, I've decided to not only show you the proper way to do something, but also the improper way to do it too. On this project, I drew out this original thumbnail sketch. Normally, I'd then refine the thumbnail to create a tight sketch, but in this case I decided to be lazy and moved forward using this as my guide. At the time, I decided to do this because of the method I planned on using to create the art. I didn't think I needed to refine it more. I scan my thumbnail in, clone and flip it in Photoshop to give me the full image needed to build from. Problem is my art isn't precise. It's too rough as you'll see, so it leaves far too much guess work at the build stage. This will make more sense as you go to the next several images. The specific art style I had in mind for this was to use use fat strokes to form a very graphic and iconic illustration. The problem however is that style works best with geometric forms not more organic shapes like this sketch. In a nutshell, I kind of talked myself out of listening to my better creative judgement that was telling me avoid this direction. But I rationalized to myself thinking it would work out OK. In hindsight, I think many creative types do this all the time. They approach the computer before they really know what they are going to do. It's like building a house without bothering to finalize any blue prints. You'll run into build problems along the way. At this point, I'm beginning to see the futility of my ways. So far it just doesn't feel right. It's hard to put into words what I mean by that, it's just kind of like creative instinct. Over time you know what to expect when you have a refined systematic creative process. I was straying off that path and it was feeling awkward. I decided to test what I had done so far. So I fattened up the lines and filled it in with some color to see how everything felt and that is when I knew I had definitely made a mistake. It's not like this build style couldn't work. It could, but the foundation I was building upon was weak to begin with. It wasn't the right type of base drawing to work from and wasn't refined enough to remove guess work. It left too much room for chance to play a part in the process and that almost always leads to poor decisions. In a nutshell, I hadn't spent the necessary time working out what I was going to build and instead just jumped into it. Even someone whose been in the industry as long as I have makes rookie mistakes from time to time. So it's time to start over. I wasted a good 40 minutes or so and really have nothing good to show for it. I go back to the drawing board and using my rough sketch as my guide I refine my artwork, work out the shapes with precision so I know what I am going to build before I build it. Drawing my artwork larger allows me better control of forming my shapes. It's all about balancing thicks and thins, negative and positive and knowing how much black to leave in it to create a nice contrast with the other colors so the end product balances well over all. Since this style is symmetric we obviously only have to draw half the artwork. When we build it digitally we'll clone and flip it to get the entire image for the character. A nice fringe benefit for working digitally. To learn to teach yourself how to simplify form and shapes into vector art look at a high contrast photo. Study the shadows and highlights. Even if they have a blurred or gradient edge you just simplify those shapes to form solid hard edge shapes. Some have asked how do you know what to draw? How do you know what the shapes should look like? Well, the easiest answer to those two questions are the more you do it the easier it becomes. I scan my refined tight drawing into my computer. In years past, I used to use a twain plugin for Photoshop, but scanner manufactures have become very lazy the past few years and I got tired of waiting for them to update their plugins so now I just use the Image Capture app that comes free with the MAC OS. I save my scan as a TIFF file and place it into Illustrator on it's own layer, adjust the transparency and lock it. On a layer above it I begin building my core vector shapes. I simply follow my drawing, no guess work involved. The key to quality vector building is to understand Bezier Curves. A great book resource I highly recommend is "Logo, Font & Lettering Bible" by Leslie Cabarga. This book is jam packed with fundamental methods about vector building that once learned will make you a the bezier curve Jedi Master. Another great Illustrator plugin I use everyday is called Xtream Path. This plugin works better then Illustrator's own tools and speeds up build times. I really do wish Illustrators own editing tools worked as smoothly as this plugin does. I now have all my base vector shapes built. Once again since this is symmetrical I only have to create one half of the artwork. I copy my finished shapes and flip them to form the remaining half. I select the shapes from both sides and using the Pathfinder palette I Unite them to form the final vector shapes needed. Think of it as digitally welding the two halves down the middle. The red circles denote the areas I've united together. At this point I quickly color the shapes so that the only thing you see is fill color. No strokes are used. I originally thought I'd color the Ferengi "Green" but the more I referred back to my reference I saw they weren't really that color. Other than that I thought the art was on target at this point. Far superior to the other path I was headed down previously. I alter the general skin color that better represents a Ferengi. At this point I walk away from the job. I call this the Fresh Eyes Effect. I approach it in a few hours and scrutinize my art. This is the best way to self art direct yourself. Look for areas to improve upon. Upon a fresh look, I noticed the ears needed more attention. The shadowing wasn't deep enough and for a Ferengi that just wouldn't do. They are all about two things Latinum and Lobes in that order. Always look for these small areas you can improve on. They all add up, either in a good way or a bad way, if you don't seek them out and fix them. The easiest way to fix the art is to create a shape and lock it into position on one side, knowing once you have it worked out, you just copy and flip it to get the other side corrected. Flip the corrected ear detail. At this point I also noticed his lower lip needed to be beefed up some too. This is all part of a systematic creative process. I now have all my base art refined and have once again adjusted the skin color so it's a little more orange in tone. I also ever so slightly beefed up the outer black edges thickness too. I'm now ready to start working out my details. At this point, I print out my art in Black and White, then using a regular pencil, I begin to work out my shading and highlight details. This style is more graphic than it is photographic so I'm not really following anything in my Ferengi reference pictures from above. I am just free drawing at this point. On this artwork I'm thinking the light source is symmetrical too shining down from the top middle above the head. Thus all my shadows will be under the shapes for the most part and the highlights will appear at the top of the shapes in my artwork. This rule isn't ironclad however. Sometimes you just do what looks good even though it would probably never look like that in real life. And that is where illustration exceeds mere photography. Photography even in it's most abstract form tends to be governed by light. Illustration can do whatever it likes within a variety of given styles. (But I'm sure some photographer will read this and feel obligated to prove me wrong). The venerable No. 2 pencil, still a heavy lifter in the creative process. I take my scan of the shading and highlight detail, then place it into Illustrator. Next, I adjust the transparency and lock the layer, then move it below a copy of my base artwork which I've colored blue. Like my original scan, I follow my new detail scan to create my shading shapes. To help distinguish them I have colored the new shapes pink. Once I have all my shading shapes built, I copy and flip them to get what I need for the other side. The original base shape is colored blue and the new shading shapes are yellow. The next few steps involve the Pathfinder pallette. I take my original base shapes filled blue and my new shading shapes filled yellow and will use the Pathfinder to Intersect the two to form my final shading detail. This shows the resulting Intersect from the blue and yellow shapes. In CS3 it was a two step process. You would click Intersect and than click Expand, but in CS4 it automatically expands unless you hold down the Command key while clicking. This shows the final shading detail shapes expanded. The next thing to do is to build the highlight shapes. Then I'll have everything I need to finalize my coloring. You can now see how the coloring has progressed with the detail shapes built. If you look through the source file I've layered everything so you can deconstruct it easily. Keep in mind this is ultimately geek art. 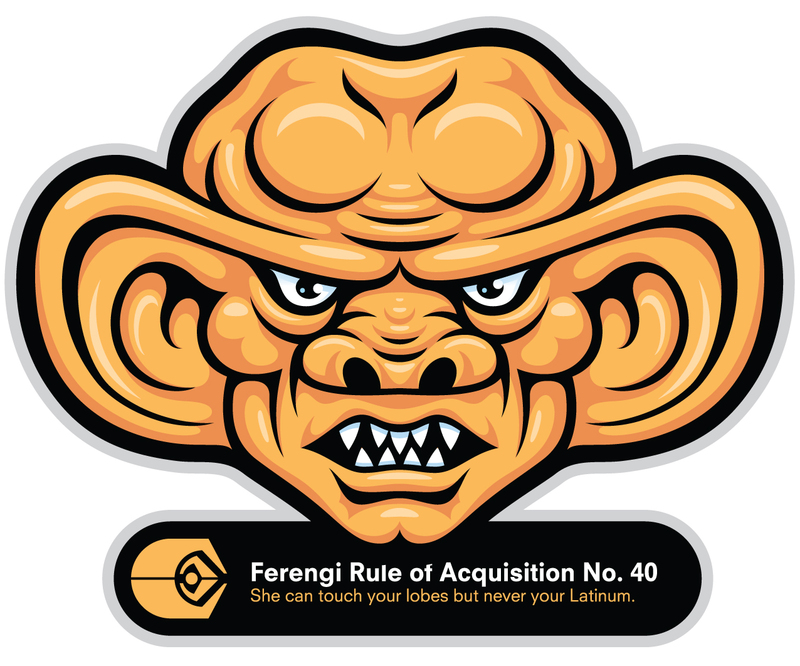 And since this is a Ferengi I wanted to include one of the Rules of Acquisition within my design motif. You see the Ferengi have 286 Rules they follow for gaining and retaining wealth. I decided to go with "Ferengi Rule of Acquisition No. 40" which says "She can touch your lobes but never your latinum." So you may be saying, "Hey what happened to all the shading and details?" Well no worries I just wanted to show you a before and after for the detailing so you could see how much life this brings to the overall illustration adding this kind of detail. This is the final art. Compare it to the previous image above and you'll see how much detailing will add to an overall illustration. So once you have fan art done what can you do with it? Well this entails repurposing the artwork in a variety of fun ways to share the artwork. I always look for ways to put my art to use. I had noticed before hand that a developer had made a widget based around the Ferengi Rules of Acquisition so I approach him about using my art on his newest update and he agreed. You can download the Ferengi widget here. The only thing other then geeky sci-fi I get more excited about is Apple products. So naturally I have to make a wallpaper design using my new fan art. I've included this in the source files too so you can let it grace your smart phone. As time permits I want to illustrate other sci-fi characters I like: Andorian, Sleestak, Dominar Rygel XVI, Cardassian, or The Borg. If you're not sure what topic you'd like to illustrate just focus on one that you are passionate about. Doing that will make the whole process easier. If you like fantasy novels maybe the character comes from that? If you like the new TV series "Fringe" it could be "The Observer?" What ever the fan art source have fun creating it and sharing it with others. If you'd like to learn more about the illustrative design creative process visit IllustrationClass.com. The final image is below. You can view the large version here. Von Glitschka is an Illustrative Designer. Glitschka Studios is a a multi-disciplinary creative firm whose work reflects the symbiotic relationship between design and illustration. The studio shines as a hired gun for both in-house art departments and medium to large creative agencies.